During the funk era, heavyweight boxing champ Muhammad Ali proved a great source of inspiration for many musicians and bands. Dig hard enough and you’ll find tons of singles recorded in tribute to the legendary fighter. 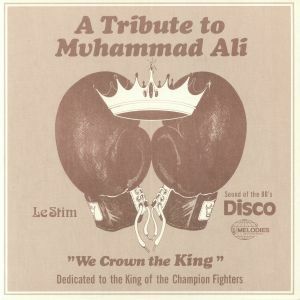 Le Stim’s 1980 disco-funk tribute to “the king of the fighters” is not one of the better-known examples, but it’s certainly one of the most scintillating. Here, the sought-after gem – all rousing horns, Clavinet-heavy grooves, spacey synths and starry-eyed vocals – is given the reissue treatment by Melodies International. Like the hard-to-find original, it includes both “long” and “short” versions, with the former – a sweaty, nine-minute workout straight from the top shelf – standing out.